Top Resort: 10/10/10. Easy I-95 access: NC #61. Near Fort Bragg; special military & LONG TERM rates. Huge FHU 50-amp sites, Charming cottages. Fitness center, 2 pools, playground, free WiFi & Cable. Free waffle breakfast. We stopped here on the way to Florida. Very easy to access from I-95 but not so close that you hear road noise. Very clean and well kept up. We were here in January so the pool was not open. We looked in on the other facilities- very clean and well maintained. Since we were on our way south we had a pull through site. Nice level site, and again, it was well maintained. This was our first time in Fayetteville NC. The camp ground was so easy to get to, right off 95. Our stay was great. We stayed 3 nights and 4 days. The cabin was very clean as well as the grounds. Everyone was very courteous and helpful. We will defiantly be returning. Thank you all. 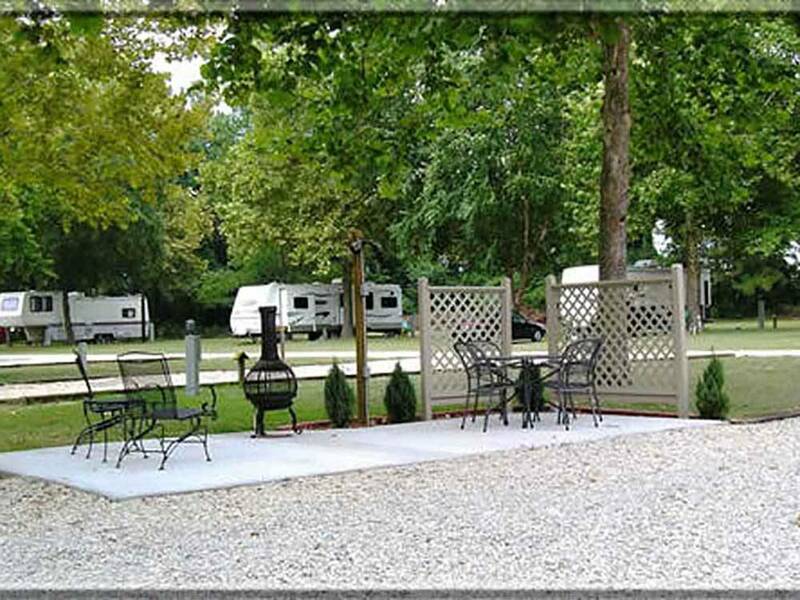 Great RV Resort with level gravel pads, nicely appointed with picnic tables and some with fire pits. The bathrooms are clean, well kept, with hot water for a quick shower and a great laundry room. Good internet, cable and all the amenities you look for in a resort. I highly recommend this park for any of your RV'ing needs. Excellent facility, reasonably priced would arrange our travel to stay here again. We stayed one night on our way from Florida to Maryland in our 35 ft motorhome with our car in tow. We have previously stayed at this campground due to its convenient location but, on this stay, we found the facilities to be much improved, landscaping to be very attractive, and staff to be most friendly and responsive. We will make it a point to visit here again. Stayed here for a night on a trip back from Florida. I only wish we could have stayed longer. We arrived after hours and our site information was all ready in an after hours box. Our site was an easy hookup with everything just a few feet from the trailer. No leveling needed. Walked around the park and we were amazed by the amenities and cleanliness. No wi-fi even with password. Dog leash rules not followed by long-term residents resulting in our dogs who were on 6' leashes being accosted and another camper expecting traffic to watch for her dog instead of reeling the dog in. Surprisingly hers was on a long flexi-leash. No information for who to call after 5pm (@7pm). We stopped here overnight while traveling north on I-95. Entrance is less than 1/2 mile from the I-95 exit; convenient but no road noise. The office is a KOA-style a-frame building but this park is far superior to many of the former KOA facilities; very friendly and professional staff. A lot of money and effort has gone into this park; the pool, mini golf, playground and cabins look like very recent upgrades. Roads are either paved or graded stone. Most sites are spacious pull thrus with easy access and excellent satellite reception. As part of their customer focus, most "overnighters" stay off the main entrance road with a straight shot exit to limit the noise of early departures. They even put the dumpsters next to the entrance so early AM garbage trucks won't disturb the campers. 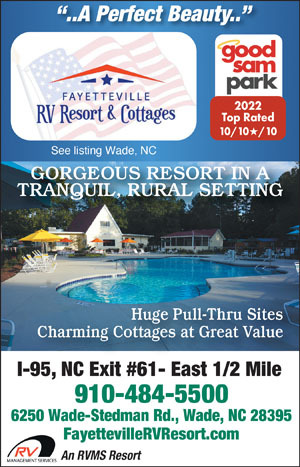 Definitely a place to keep on my list of "go to" RV parks. We stayed there over New Year and were entertained by an on site fireworks display. These people make all feel like friends and family. Park has large sites and lots of room. Utilities work well. Lots of trees in parts of it. You get shown to your site. Big park so lots of room to walk and includes a nature trail through the woods. Sites are gravel. We had a deluxe site with a concrete patio. Quite a few cottages and also monthly sites. Park was quiet when we were here. After driving up and down I-95 for many years we stayed at this campground and was pleasantly surprised. We have a 45ft Class A with a tow and their pull-thru sites are very easy to get in and out. Great place to walk your dogs as the campground is very clean. This campground is very convenient to interstate 95. The staff was helpful and friendly, you are escorted to your site. The sites are gravel and very level and spacious. We did not hear any highway noise. They separate the seasonal and transient campers which is nice.This campground has 2 pools, a nice playground, clean restrooms, nice clean store with most campers needs. The laundry is clean and works very well. The internet is good, but we had some fuzziness on the cable, but it was ok. We will be utilizing this campground anytime we travel on I-95. We recommend this GC to all fellow campers. Stayed here again as a stop over on the way to FL. Very nice and convenient to I95. Free waffle breakfast in the morning when we stayed! We have stayed at this campground for years when we travel through North Carolina. It is always a pleasure. It is located right off of I-95. The camp hosts and staff are very friendly and helpful. The sites are easy to pull in and are nice and level. The grounds are immaculate and landscaped beautifully. Restrooms are spotless. I highly recommend this campground to all of our RV friends. This is a very nice camp ground directly off of interstate 95. The staff was nice and helpful. The sites were spacious and level. The CG is full of mostly long term campers but they are on the opposite side of the CG. The CG was very quiet with a few things do to ie, basketball, horse shoes, workout room, and 2 pools. The location makes it very easy to access if traveling north or south on the east coast. I will definitely be coming back again. very nice campground, priced at top end. Outstanding park. Friendly staff. The sites are well maintained and marked and the overall park is beautiful. The WiFi is fast and free and so is Direct TV. Free waffles for breakfast during the week. It's close enough to I95 to be convenient, but far enough away to be quiet. This is the perfect park.